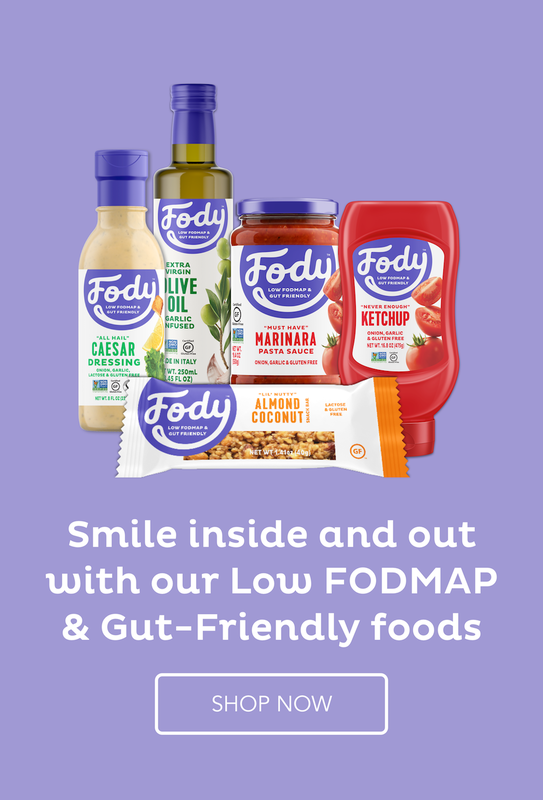 Low FODMAP carp fish in jelly – I know that fish in jelly might sound weird for an English speaking world. It is a Polish speciality, that we make only for a Christmas Eve supper and it is delicious! We eat a lot of fish for Christmas Eve supper, because it used to be forbidden by the Catholic Church to eat meat on a Christmas Eve, so all dishes were either vegetarian or with fish. Now there is no meat prohibition, but the tradition stayed. 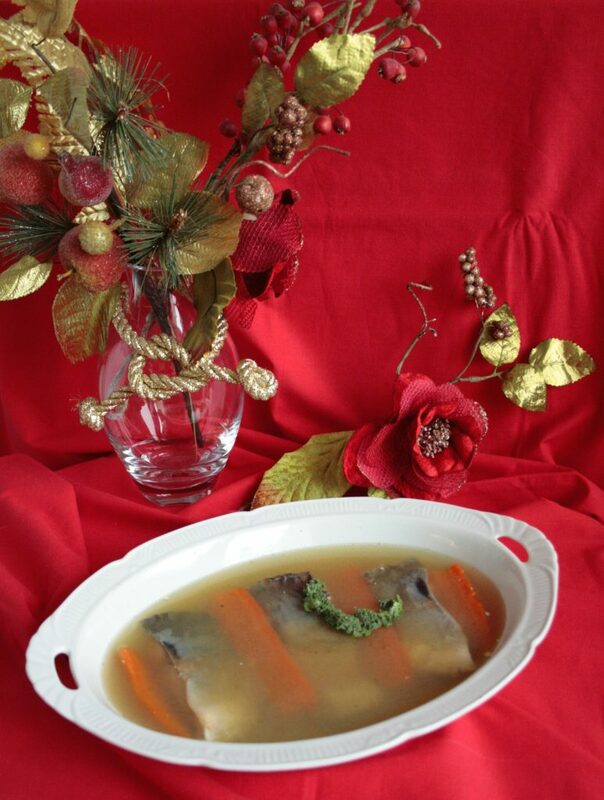 This Christmas Eve speciality – carp in jelly have always been served on my family’s supper table. 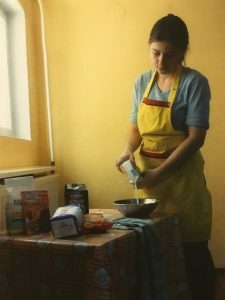 Only few years ago I was brave enough to prepare it by myself in my own house. Probably the reason for this is because it requires quite a lot of work (it is worth it, though!) and we all are always so busy at Christmas time. So my Mum’s instructions that she was always teaching me, were very helpful and now I make this carp in jelly in my own house every year. 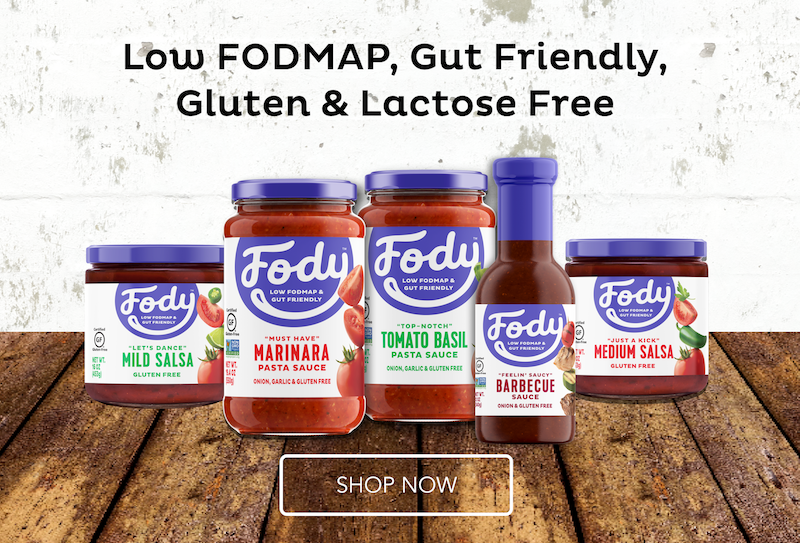 This time I had to prepare this dish as a Low FODMAP carp in jelly, due to my diet for Irritable Bowel Syndrome. It wasn’t that difficult, because I only had to remove the onion from the recipe. So, let’s get to work! Carp has been killed at the fishmonger (I do not buy it in the supermarkets). 6 spoons of a powdered gelatine (I used it for a 1 litre of liquid stock, you might need to adjust it, depending on the gelatine you will get in the shops). 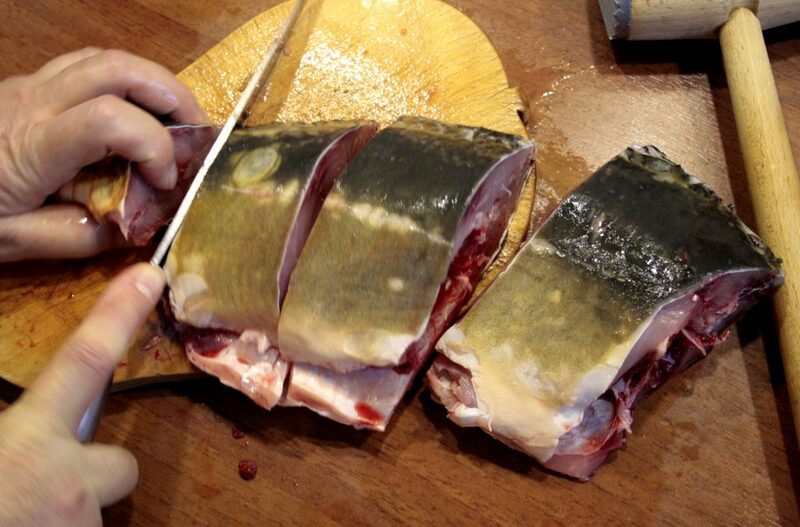 If you don’t want to do all of these dirty job – cleaning the fish etc., you can buy a ready fillet. 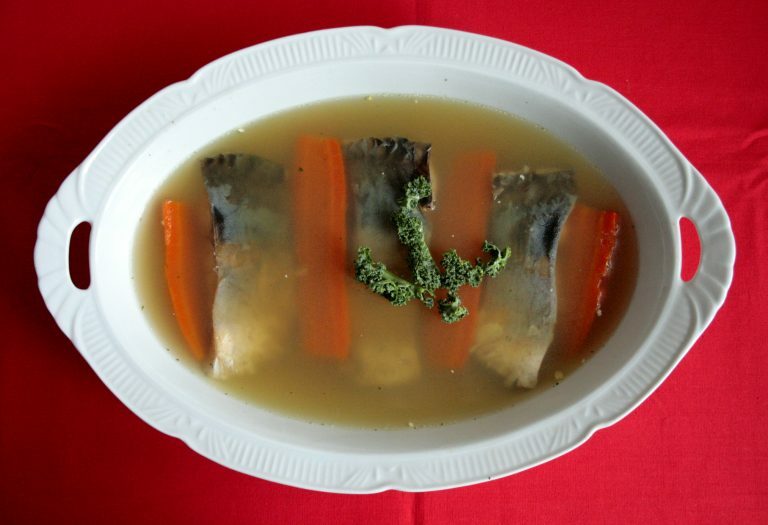 But your stock won’t be as good – because all leftover bits are being used for the stock, including the fish head (after removing the eyes, because they can give a bitter taste to the stock). First, the carp needs to have scales removed and fins cut off (fins go in the pot to make the stock). Afterwards, you need to remove the guts from the fish and clean the fish under running water. Now you need to cut the head off and cut the carp into portions. Portions are easier to fillet. It is quite easy. 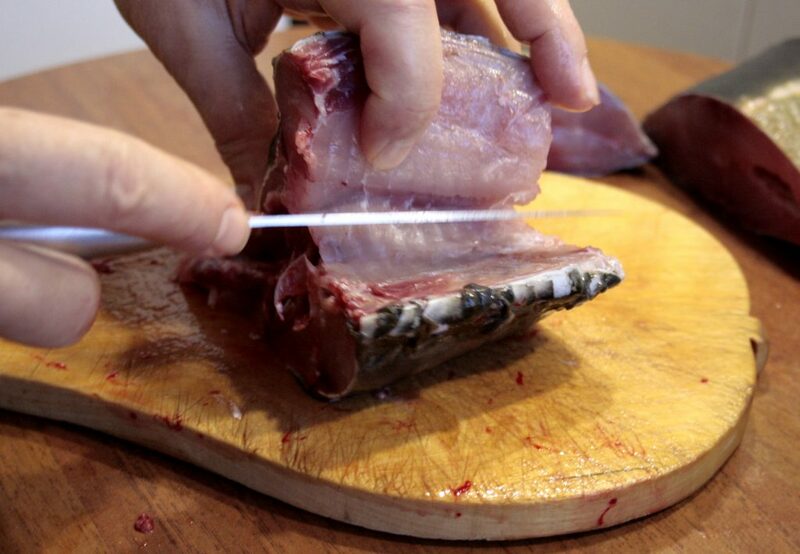 First, with a sharp knife, you need to make a cut on the spine, then go down with the blade, just on top of the bone, so you don’t leave too much meat on the bone (please see below). It wasn’t that difficult, was it? We need to place all vegetables and spices listed in a large pot, as well as carp head, fins and bones from filleting. It has to be boiled for around 30 minutes, until all vegetables are soft. Then you need to add the carp fillets to the pot, carefully, skin side down. It has to simmer for 10-15 minutes, until the fillets are cooked through. 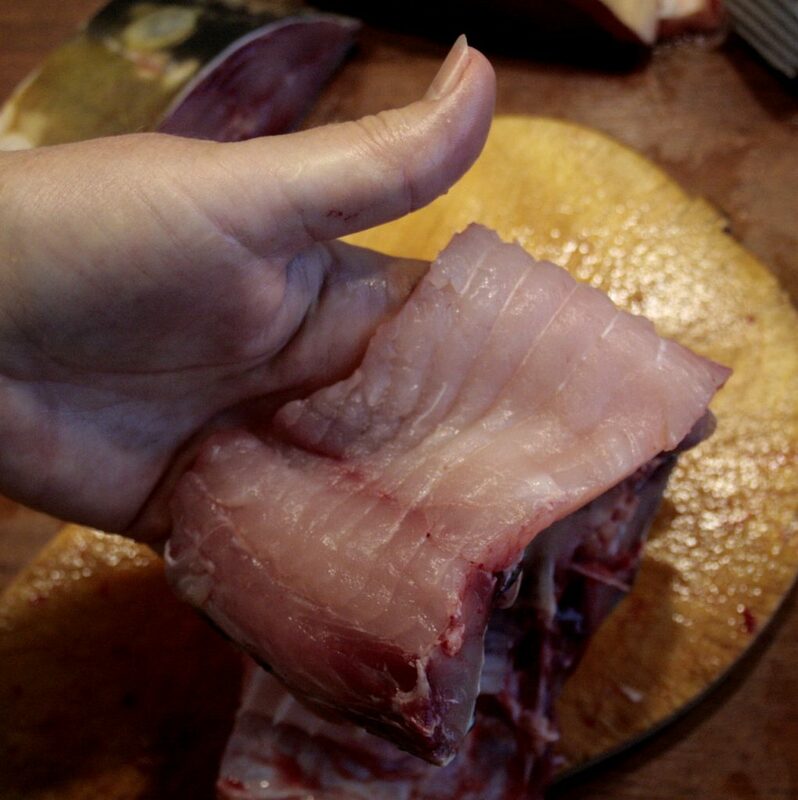 When ready, remove the fillets carefully, so they don’t fall apart, and place them on a dish. The dish can be quite flat, but deep enough to hold in the jelly made from the stock. 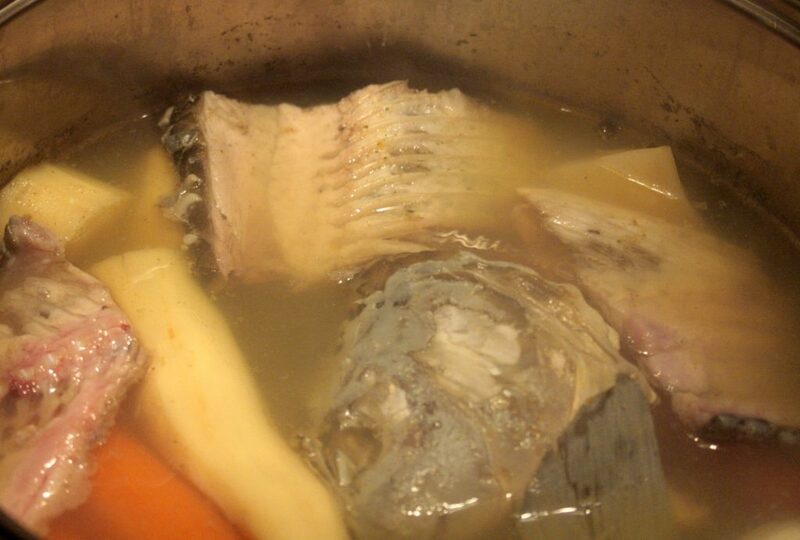 You need to place the carp fish on the dish, skin side up, with the addition of cooked carrots from the stock. You can also use other vegetables from the stock. Leftover stock has to be put through a sieve. Then you need to add powdered gelatine to it and dissolve it properly. You need to use proportions of gelatine as stated on the gelatine packaging. Afterwards you need to pour some of the gelatine stock on the carp fish fillets and carrots in the dish. Put in in the fridge, keeping the leftover gelatine stock out, watching when it is nearly set, to add more of it. The reason to do it twice or even 3 times is to make sure that all of the fish skin is covered, then it will be soft and not dried. 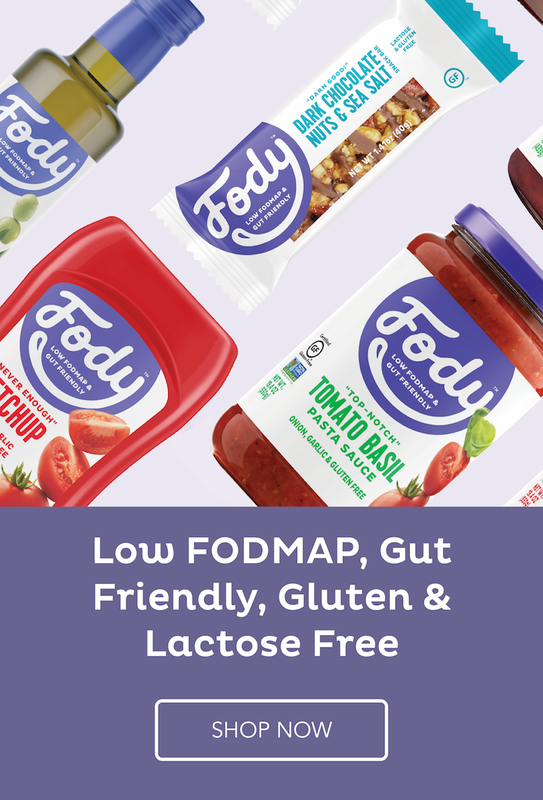 Then you need to place the dish with a Low FODMAP carp in jelly in the fridge. It is ready when the jelly is all set. We serve it with a squeeze of lemon juice.